Normally, a high-profile game is hyped to the point of lunacy...especially when downloadable content and special features are being prepared being the scenes. 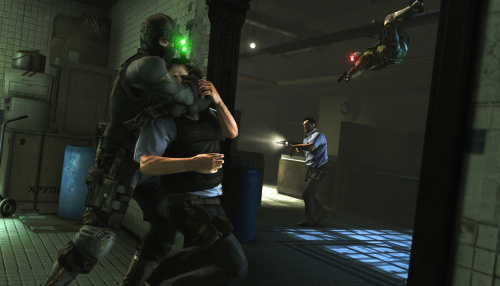 In a surprising move, Ubisoft has managed to sneak in weekly free content for Splinter Cell: Conviction. Every Thursday starting today, expect to see something new in the Extras menu. Anyone who has already bought the game will find an MP7A1 suppressed submachine gun currently available. One press of a button, and it's yours. Free. Gotta love that! Furthermore, stats are being tracked across both single-player and co-op games. If your Gamertag or PSN ID is linked up with the Ubisoft website, then it's just a matter of logging in. Otherwise, and quick registration is required. Once logged in, you can view your stats or use Ubi's web-based matchmaker. Incidentally, both myself and our tipster - Mrxknown_JG - have been advised by the stat tracker that our strong suit is "kills and accuray", which we are rather proud of. So, once again: cool game...free content. Today is a good day.